Introducing our new Bang-Kapi katsu. Served daily from noon until 7pm. It’s one of the best surprises from our recent trip to Bangkok seeing Thailand’s very own version of katsu. 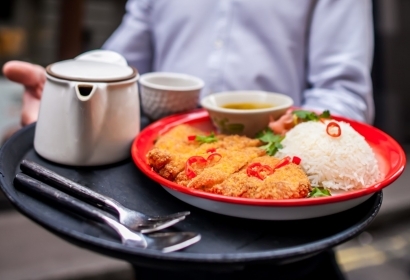 It’s named after district (Bang-Kapi) where we first saw Bangkok’s love for Thai katsu. Our tip is to pour the golden curry sauce over the breadcrumb coated chicken and top this with our pickled ginger and green mango salad! This dish has fast become a favourite on our Bangkok Express Lunch and 2 plate Bangkok Fix menu. Try it for yourself.